Commencing at 8 pm, doors open at 7.30 pm. Special re-engagement of Mr Tom Morgan, The eminent Cornet Virtuoso and Band Trainer, late of HM Coldstream Guards Band, who will give exhibition solos and conduct the performance of the Recreation Band on this occasion. Soprano Miss Edith Brockley, Baritone, Mr W Lauder, Humourous Mr Harold Johnson, from London, Solo Pianist and accompanist Mr G F Brockless, Cer. Pianist, TCL. Prices of Admission 3s, 2s (reserved) 1s and a limited number at 6d. 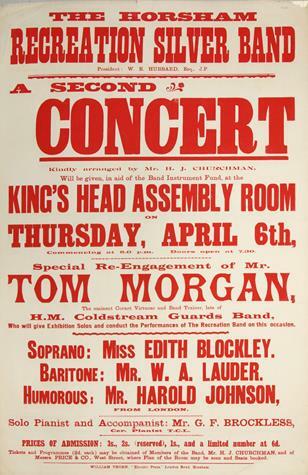 Tickets and programme (2d each) may be obtained of members of the Band, Mr H J Churchman, and of Messrs Price & Co. West Street, where plan of the room may be seen and seats booked.